Cranial Cavity is the main cavity of the skull. It lodges the brain, meninges, portions of the cranial nerves and blood vessels. The floor of the cranial cavity is composed by the upper surface of the base of the skull and it is roofed over by the skull cap. The skull cap or the vault of the skull creates the roof of the cranial cavity. It is created from superior portions of frontal, parietal and occipital bones. On every side, the floor of the cranial cavity is divisible into 3 descending ‘steps’ by 2 sharp bony ridges, viz. the posterior free border of the lesser wing of the sphenoid (sphenoidal ridge) in front and the sharp superior border of the petrous temporal bone (petrous ridge) behind. The 3 measures are called the anterior, middle and posterior cranial fossae. 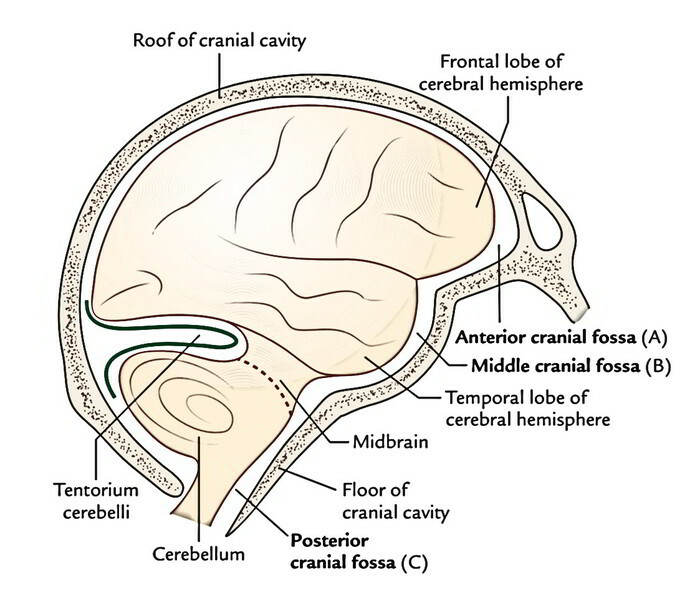 Consequently, the anterior cranial fossa is right at the greatest level, the posterior cranial fossa in the bottom level and the middle cranial fossa in the middle level. The internal outermost layer of the base of the skull is split into the anterior, middle and posterior cranial fossae. They may be ordered like 3 patios with descending levels. The inside of the cranial cavity is lined by the dura mater and the surface of brain is covered by the pia mater. Between these 2 is located the arachnoid mater. These 3 membranes jointly make up the meninges of the brain. The arachnoid mater is linked to the pia mater by many fine filamentous processes. These 2 membranes are held together and closely related to the brain and consequently, discussed with the brain. By the separation of 2 layers of cranial dura. By the reduplication of the meningeal layer. 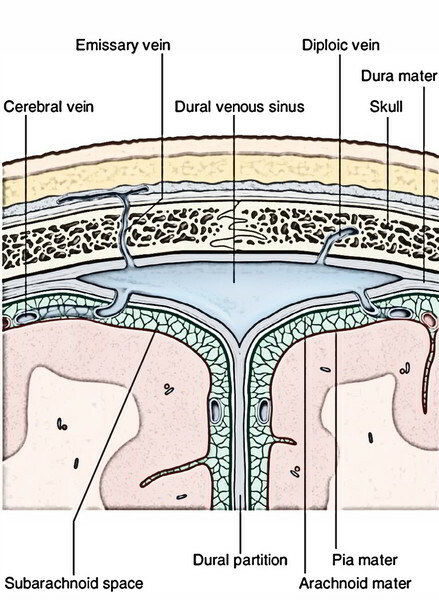 All the venous sinuses, with the exception of the inferior sagittal and straight sinuses are located between the meningeal and bargain layers of the dura mater. The sinuses have thin walls and are lined by endothelium that’s constant with that of veins. They drain blood from the brain and skull bones. The blood from dural venous sinuses is ultimately emptied into internal jugular veins. 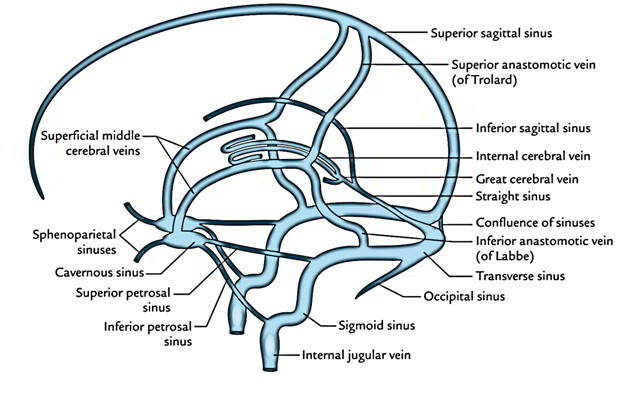 Several of the sinuses convey with the veins outside the skull, via emissary veins. Be Located between the layers of the dura mater. Have no muscle inside their walls. Lined by endothelium only (muscular coating is absent). Are devoid of values in their own lumen. Receive venous blood and CSF. Receive valveless emissary veins which modulate the blood circulation and keep the equilibrium of venous pressure inside and outside the skull. There are about 21 sinuses. They may be classified into 2 types: paired and unpaired. 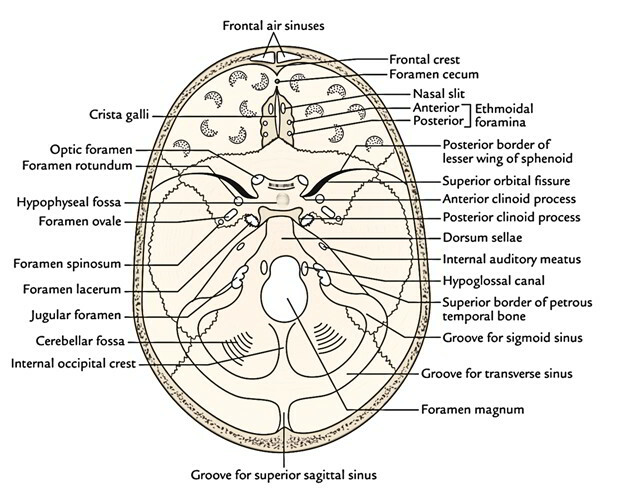 Categorization of the dural venous sinuses (7 matched and 7 unpaired).